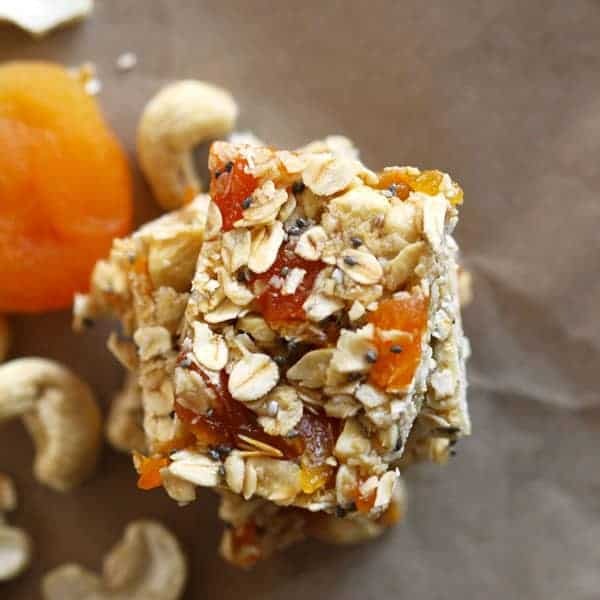 Why buy store-bought muesli bars when you can make your own delicious and healthy no bake chewy apricot muesli bars in just 15 minutes! I’m a huge snacker. I could literally graze all day and I have to regularly stop myself from mindlessly munching. I try not to keep any junk food on hand and I keep the house stocked with healthy snacks like fruit, nuts and energy bites at all times. My no bake chocolate fudge energy bites are always on high rotation. So too are my no bake apricot coconut energy bites. 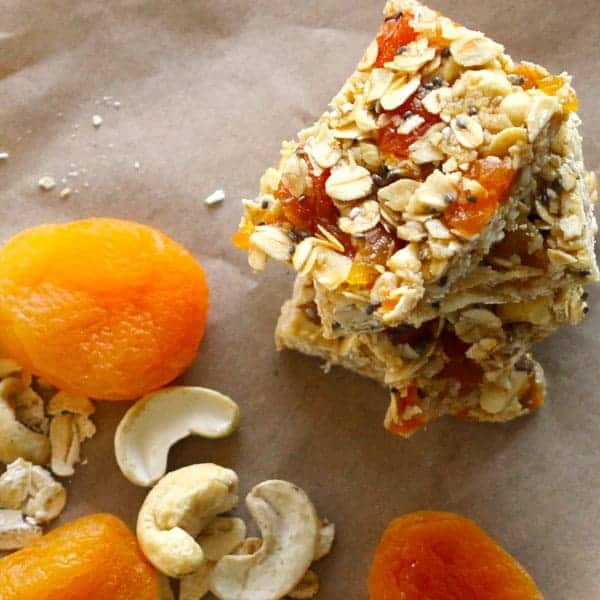 And more recently, it’s been these delicious no bake chewy apricot muesli bars! I mentioned a few weeks back that I was trying to replicate a store-bought muesli bar I love that has apricots, coconut and chia seeds. After many failed attempts I’m so happy that I can finally share this recipe in all it’s tasty glory! I love that these muesli bars are so simple to make that it’s almost easier to make your own than buy them from the store! I’m sure these would be perfect for kid lunch boxes or as an after school snack. Or just save them for yourself and enjoy as an afternoon pick-me-up! 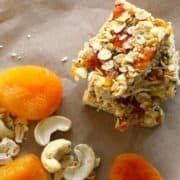 Stop buying muesli bars and make your own with this easy no bake chewy apricot muesli bar recipe. Combine butter, rice malt syrup, vanilla extract and salt in a small saucepan over low heat. Cook, stirring occasionally until the butter is melted. Add the rest of the ingredients into a mixing bowl and pour the hot liquid mixture over the top, mixing thoroughly. Press the mixture into the lined pan, ensuring there are no holes. Make sure the mixture is pressed together well (can press together with your hands) as this will ensure the muesli bars hold their shape once cut. Place the pan in the freezer for 2 hours, then cut muesli bars and store in an air-tight container in the fridge for 1 week. Can substitute apricots for another type of dried fruit (I’m thinking sultanas or cranberries). Can replace rice malt syrup with honey, maple syrup etc. If you like your muesli bars more on the sweet side, you can add 1/4 cup of brown sugar when you are melting the butter. Oooh delicious and what an amazing idea. I am going to try this next weekend, pinterested this post! these look incredible and are the perfect snack to take with me on a hike. I love how you are using muesli as a base. Thanks Andrea 🙂 hope you like them! I’ve made my own bars before and they make the perfect snack. I have to try making these. Your recipe looks so good. That looks awesome! I didn’t know much about meusli until I took a cruise and they had it on there. That is some good stuff! I think these bars would be great! These look wonderful! I grew up with an apricot tree at a close friend’s house so I love anything with this fruit. I bet my daughters would love this for breakfast! Having an apricot tree so close by would have been amazing! These sound like the perfect summer treat and absolutely beautiful! I love that these bars are so easy to make and contain healthy ingredients. They are perfect for taking with me on-the-go. I was just thinking about making some bars at home again. I was on a kick for awhile but then got lazy. Feeling inspired to whip up a batch, especially with all the rainy weather. Raining weather is perfect cooking weather! These are mind kind of bars, crunchy, chewy and filled with so many good for you ingredients. I want to try these out, you pretty much had me a “no-bake.” They look like the perfect hiking snack! Haha Nikki! I love a simple recipe! Wow, these bars look really tasty! I would love to make them for my kids because I am always looking for healthier snacking options. Hope your kids love them Amy! What a great recipe. I love the sound of apricot. It really adds such a nice element to these bars! These look amazing. I forget how good apricots are and this is a fantastic reminder to use them more often. I can’t wait to make these. Hope you love them as much as I do Terri! oooo! Going on a road trip in just over a week and these would be perfect to bring! Oh they would be absolutely perfect for a road trip! What a great idea. These look healthy and delicious! Apricot is just a lovely fruit for desserts like this! It’s awesome that you’re sharing this recipe. I can’t wait to give it a try. These look delicious. I wonder how they would be effected if I used honey as the sweetener. Hope you love them as much as we do Shileen! I made something similar in the past but they were shaped like little balls. They’re good! I’ve never been a big fan of apricots, but my family LOVES them! I may have to try these! I think they are an acquired taste Amber! You either love em or hate em! I’m a huge snacker! I ended up getting a subscription box to get healthy good snacks. I have never had a muesli bar, sounds interesting. I’m very interested in a subscription box of healthy snacks… I must look into this at once! I think you guys may call them granola bars! I love Muesli! I don’t know what I never thought to make bars out of it! What a wonderful nutritious idea! I keep saying that I totally need to make our own granola or chewy oat bars. This recipe looks delicious- and I could totally do this! I don’t like long hard recipes – so this is totally doable! Great post Cassie. What a FAB idea, my kids love to snack and what a brilliant idea to make these. We are not a lover of apricots but love sultanas!! I reckon they’d taste so good with some sultanas! I made something like this recently. Soooo good and so easy! Chewy bars are my favourite! Thanks Arita! I hope you like them! Thanks Glenda! I really hope you enjoy them! Yum they sound awesome too! These sound awesome. I am always on the run, so I love snacks like this that I can just grab and go!! Grab and go is so good for busy days! Looks delicious! I will surely try this at home. Oh yum! I’m also a snacker and my kids are becoming snackers, too. I bet this is something my whole family would eat! Delicious! My husband loves muesli and he would love me to experiment this with apricot. I would love to try this next weekend. Awesome Sona! Hope you enjoy!